After an abysmal two months, the Montreal Canadiens are finally starting to see a light at the end of the tunnel. They’re riding their first two-game winning streak since November, and with 28 games remaining, the Habs haven’t completely played themselves out of a playoff berth yet. With that said, the odds aren’t on the Canadiens’ side. According to Sports Club Stats, Montreal has just a 17.2 percent chance of getting to the postseason. Essentially, the Habs will need to win two-thirds of their games the rest of the way to have a realistic shot at a wild card spot. Fans and analysts, alike, are already ruling Montreal out, with some critics even advocating for losses in hopes of a high draft pick. Frankly, tanking might be what’s best for the team at this point. The Canadiens have a strong core to build around, and adding another elite player would only help their chances of becoming a long-term Stanley Cup contender. There’s only one problem — they can’t tank. First of all, tanking doesn’t exist in professional sports — at least, not in the way most people interpret it. No player is going to play with the mentality that they want to lose. No coach is going to purposefully ice a lineup or implement tactics destined to fail. It doesn’t work that way. Tanking only exists on the trade market; selling being the only approach Montreal can take to facilitate a downward trend in the standings. Those decisions rest solely on Marc Bergevin’s shoulders, and with some bad contracts on the books, his hands may be tied. Now, Bergevin has bargained his way into some phenomenal deals. Brendan Gallagher and Max Pacioretty are both under cheap long-term contracts, Carey Price is locked up through 2017-18 for a reasonable price, and even Alex Galchenyuk settled for a low-ball offer. Bergevin has quickly developed a reputation for being a strong negotiator, and the Habs have benefited because of it. Despite his successes, the Canadiens GM has made his share of mistakes — namely with handling veteran contracts. As sellers, the Canadiens would ultimately be looking to offload aging veterans. Tom Gilbert, Tomas Fleischmann and Dale Weise come to mind, but depth forwards and bottom-pairing defensemen aren’t exactly in high demand. The Habs wouldn’t be doing a very good job tanking if they were offloading their worst players, either. Tomas Plekanec and Andrei Markov are the type of players contending teams would be looking for. They’d also be the players Montreal would need to deal if they were serious about tanking. The issue is their contracts have rendered them virtually untradeable. Had No. 14 and No. 79 been signed until the end of the 2015-16 season, it would’ve been relatively easy to deal them to a buyer. They both play a sound two-way game and bring an invaluable veteran presence to the table. Alas, Bergevin signed Markov to a three-year deal in 2014 and, earlier this season, extended Plekanec another two seasons at a $6 million AAV. Both contracts aren’t cheap and go beyond 2016. With teams struggling to manage the cap, having a declining player take up a chunk of cap space isn’t desirable and, in most cases, unfeasible. With trading out of the question, it’s more likely Montreal claws closer to a playoff spot, rather than dipping further away. 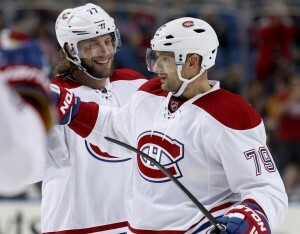 Simply put, the Canadiens are too talented to tank (even with Price sidelined). They’ve been free-falling for two months — and have been far and away the worst team in the league — but to expect that to continue is a tad far-fetched. The Habs probably won’t make the playoffs, but all they can do is try.